Long-time readers of this blog will recall that I discussed Medicaid Work Requirements being proposed by the current neo-fascist regime in Washington. Now comes a few new posts from several sources, that expands on the subject, especially regarding the way the courts are responding to the administration’s desire to impose draconian work requirements on what is essentially a health care program, and not a make-work program. Note: I am awaiting enrollment into Medicaid. The following articles all involve the Arkansas Medicaid Work Requirement case, and one judge in federal court has already decided that Congress clearly intended Medicaid to be a health program, and not a work program. Shouldn’t we instead have a public policy that says that anyone who needs health care should be able to receive it? That is not the case now, even though we are already spending enough to guarantee health care for everyone. We could do that merely by enacting and implementing a single payer Medicare for All program, and it doesn’t have to cost us any more than we are already spending. It would be great if our government also supported more effective policies to ensure that every capable person has employment opportunities, but depriving people of their health care is not an effective work program, as Arkansas has demonstrated. called the VA, and that has been a disaster for our veterans seeking medical care. and to stop dividing people into silos. This entry was posted in Arkansas, Medicaid, Medicare for All, Work requirements and tagged Arkansas, Courts, Federal judge, Medicaid, Work requirements on March 20, 2019 by Transforming Workers' Comp. Modern Healthcare reported yesterday that the State of Arkansas dropped almost 4,000 of its citizens from the Medicaid expansion because of failure to comply with work requirements the state enacted months ago. Nearly 4,000 Arkansans lost their Medicaid expansion coverage in October because they didn’t comply with the state’s new work requirement. Another 8,462 low-income adults lost benefits in the previous two months. This entry was posted in Arkansas, Employment, Health Care, Health Care Benefits, Medicaid, Medicaid Expansion, Work requirements and tagged Arkansas, Employment, Medicaid, Medicaid Expansion, Work requirements on November 16, 2018 by Transforming Workers' Comp. Last month, you may recall, I posted an article about Medicaid work requirements in Arkansas from an article in Health Affairs. Today, Health Affairs posted a follow-up article that reported that thousands are being shed from the Medicaid rolls in Arkansas. According to the article, the Arkansas Department of Human Services officials announced on Sept. 12 that 4,353 people who were enrolled in the state’s Medicaid expansion program had been locked out of coverage for failing to comply with the work requirement for three months. The agency has said those people will have until October 5 to apply for a good cause exemption if they were unable to access an online reporting portal because of network server issues that affected it and other agencies. This entry was posted in Access to care, Arkansas, Health Care, Medicaid, Medicaid Expansion, Work requirements and tagged Arkansas, Health Care, Medicaid, Medicaid Expansion, War on the poor, Work requirements on October 2, 2018 by Transforming Workers' Comp. Note: One more state is attempting to include work requirements for Medicaid recipients, as previously posted in Arkansas Medicaid Work Requirement Failing Out of the Gate. Two JAMA studies bolster critics of work requirements who say most Medicaid recipients who are able to work are already doing so, and tracking compliance will heap more administrative burden onto an already-taxed system. This entry was posted in Access to care, Arkansas, Health Care, Medicaid, Medicaid Expansion, Michigan, Work requirements and tagged Health Care, Medicaid, Michigan, War on the poor, Work requirements on September 12, 2018 by Transforming Workers' Comp. Health Affairs blog published an article recently about the early experience of Medicaid recipients in Arkansas after that state implemented a work requirement in June. Last month, I wrote an article that reported that work requirements for Medicaid worsen health. The author of the Health Affairs article, Dr. Jessica Greene, is a Professor and the Luciano Chair of Health Care Policy at Baruch College, City University of New York. She conducted in-depth interviews with 18 adult Medicaid recipients in northeast Arkansas in mid-August. Dr. Greene admits that the interviews are too small a group to provide generalizable results, the interviews do illustrate how the state’s policy is interacting with the day-to-day lives of Medicaid recipients to produce serious potential consequences that have little to do with policy’s stated objectives. Of the nine people who, based on their age, should have received a DHS letter letting them know they were subject to the work requirement, four said they had received a letter. Two said the letters indicated they were exempt because they already met the SNAP work requirement. The other five who should have received a work requirement letter were either not sure if the letter arrived or thought it had not. When asked about receiving a DHS letter, a 42-year-old woman said, “I don’t know, I’m going to have to check and make sure [I didn’t receive the letter], because I need my Medicaid card for my sugar pill and my blood pressure pills.” A 46-year-old man, who had recently completed an inpatient drug treatment program, kicking a multi-decade drug addiction, wasn’t sure either. “I may have [received the letter]…I’m horrible about opening mail….I probably throw’d it away.” While the three others did not believe they received the letter, they were all exempt by either working and/or having children in the home, but likely needed to report their hours and exemptions in the portal to maintain Medicaid coverage. Of the nine participants who were likely subject to the policy, only two were not meeting the 80 hour work-related activity requirement and did not seem to qualify for an exemption. Both told me that they were actively seeking work, and that the work requirement had not at all impacted their job seeking. In addition, those I interviewed between the ages of 19-29, who will be subject to the policy in 2019, either worked, went to school, and/or had children under 18 years old in the home. No one I spoke with reported that the policy had or would spark them to change their work-related activities. Several, who were confident of their own skills, mentioned family members who would struggle. “Half my family probably doesn’t have a smart phone….A lot of people here don’t have internet still,” a 19-year old woman explained. Others raised concerns about transportation needed to get to work and volunteering. “Some people don’t have vehicles, and sometimes it’s not necessarily their fault. Sometimes something happens and they lose their money… It’s not fair,” said a 21-year old recipient who is a college student. When I asked a woman who was looking for work whether she had tried to get help from the Department of Workforce Services, she said that she couldn’t get there because it was 30 miles away and there is no public transportation. Participants were very skeptical about the Governor’s claim that the work requirement policy would help them out of poverty, as many were already working and still struggling financially. Of the people I interviewed who were at risk of losing Medicaid coverage as a result of the work requirement, most were at risk because they lacked awareness of the policy or were overwhelmed by it, rather than because they were not meeting the 80 hours a month of work-related activities or the terms of an exemption. If this is true more broadly, the state will be ending people’s health coverage for the wrong reasons, adding credence to those who argue this policy is about reducing the rolls, rather than supporting people to get employment. A 38-year-old woman who recently had to quit her job to get her niece, who she mothers, a birth certificate and other paperwork to start school argued that the policy does not take into account the complex lives of low-income people. “You are saying this should be possible, but you don’t know my circumstances. You haven’t been here,” she explained. Given this limited, but anecdotal survey of the experience of 18 Medicaid recipients, it is clear that this idea is not rooted in any realistic and scientific study of how work requirements will affect Medicaid recipients, but rather is another way of getting people off the roles and moving towards eliminating Medicaid altogether, which is precisely what the Republican Party has been trying to do for decades. The war on the poor continues. This entry was posted in Access to care, Arkansas, Health Care, Medicaid, Medicaid Expansion, Work requirements and tagged Arkansas, Health Care, Medicaid, War on the poor, Work requirements on September 10, 2018 by Transforming Workers' Comp. Back in May, I posted a link to a Health Affairs blog article, Social Determinants Of Health: A Public Health Concept In Conflict in which it was reported that the current regime was seeking to impose work requirements for people on Medicaid. As reported then, and on Monday in a follow-up article, CMS approved the first waiver to implement a work requirement for Medicaid beneficiaries in Kentucky on January 12th. The article stated that a couple of weeks ago, a district court found the approval of these work requirements to be “arbitrary and capricious”, and in direct violation of the Administrative Procedures Act of 1996. According to the article, CMS failed to consider whether the waiver’s estimated removal of 95,000 Kentuckians was in line with the program’s goals of furnishing medical assistance, and the judge ordered the waiver to be returned to CMS. It was the government’s argument, the article states, that new research into the social determinants of health demonstrate that income and employment are associated with improved health, and so a work requirement thereby fits within the goals of the program. The case in Kentucky hinged on the fact that work requirements worsened financial assistance, which the judge pointed out is a main tenet of the program. The author then writes that if CMS wants to use research within the social determinants of health, then he will analyze Medicaid work requirements through this lens. 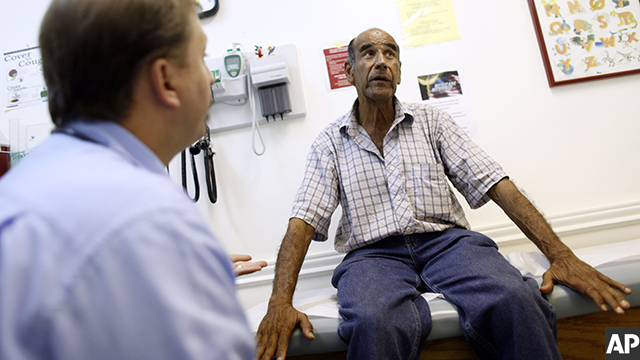 A recent post in Health Affairs focused on the perversion of social determinants of health as a concept, and the current post builds off that one, to demonstrate that this regime’s justification for Medicaid work requirements is misguided at best. To illustrate this, he follows a theoretical low-income worker, a 50-year-old from Louisville, who could no longer work in his job as a longshoreman due to cardiovascular disease and suffered chest pain whenever he exerted himself. He is uninsured, has a wife and three adult children. And is also trying to find a job. The author continues by examining the following issues: Unemployment and Health, Medicaid Improves Health, Medicaid Work Requirements Harm Those With Jobs, and concludes by stating that Medicaid Work Requirements Worsen Health. The theoretical case of the 50-year-old longshoreman is not so theoretical, as each of the 16 Kentucky plaintiffs in the case demonstrated. One is a graduating student with endometriosis, another is a mother of four with congenital hip dysplasia, and another is a partly blind mortician (no jokes, please) with chronic lung disease. All would have risked losing their coverage as a result of work requirements. And to make the case more clearly, your humble blogger, while not currently on Medicaid, but eventually will be, has end-stage renal disease, and does peritoneal dialysis every night at home, and goes to the clinic twice a month for blood work and to see the nephrologist. In addition, every two weeks on a Monday, as will happen this coming Monday, I have to be home to receive my supplies, and this Friday must call in another order. Working a full-time job, if one were available that matched my experience, would prevent me from doing so. This is another reason why our health care system is broken and needs to be replaced by a single payer system that does not separate out older beneficiaries, as Medicare does, poorer ones as Medicaid does, and children and military personnel, as the other programs do. One system for all Americans. This entry was posted in Access to care, Centers for Medicare and Medicaid Services, CMS, End-State Renal Disease (ESRD) Networks, Federal Government, Health Care, Health Care Benefits, Health Policy, Medicaid, Single Payer, Social determinants of health, Work requirements and tagged CMS, Health, Health Care, Kentucky, Medicaid, Single Payer, waiver, Work requirements on August 8, 2018 by Transforming Workers' Comp. This entry was posted in Access to care, CMS, Federal Government, Health and Human Services, Health Care, HHS, Medicaid, Social determinants of health, States, Work requirements and tagged CMS, Health Care, Medicaid, Social determinants of health, Work requirements on May 30, 2018 by Transforming Workers' Comp.